This wonderful cream cheese frosting is very rich. Once made, cream cheese icing needs to be refrigerated and keeps for 4-5 days. 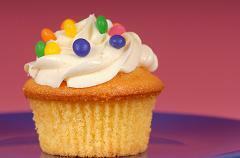 This cupcake frosting is a perfect partner for just about any cupcake recipe. You can play around with the quantities of butter and cream cheese to achieve a unique flavor. I would recommend serving this frosting with red velvet, banana, or carrot cupcakes. I also think this frosting is the perfect topping for a gingerbread cupcake. If you add a little extra confectioners sugar the frosting will become a little stiffer and this makes it perfect for piping decorations onto cupcakes. Another suggestion is to replace lemon rind with 2 tbsp. of honey for a sweeter taster. Beat cheese, butter and lemon rind in small bowl with electric mixer until light and fluffy. Gradually beat in sifted icing sugar and beat until smooth.